Shenandoah County ranks fifth in overall agriculture production in the Commonwealth. With an annual farm income of more than $100 million, agriculture is the county’s highest earning industry and relates closely to the success of other industries, such as tourism, within our county. To realize some of the exciting ideas that arose from our 2010 Farm-to-Table series, we created an agricultural initiative in 2011 to look for ways to create a more vibrant agricultural community — vital to securing our agricultural heritage, conserving our natural resources and building a stronger future for our county. The Shenandoah County Agriculture and Farm Guide showcasing the County’s rich farming heritage and providing a comprehensive guide to locally produced products available in Shenandoah County. Guides are available for free throughout the County as well as online at Shenandoah Grown. 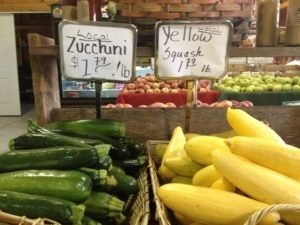 Shenandoah Forum challenges community to support local farm economy this summer by spending $10 week on locally. Our survey Consumer Interest in Local Foods in Shenandoah County was distributed to gain a better understanding of how important locally sourced food is to Shenandoah County residents, and how we as a community can strengthen our local food system.